I obtained the Pac-12 Conference video that Larry Scott sent to staff in March 2017. It rankled some staffers who thought Scott was going to announce a deal with DirecTV and instead revealed his contract extension. In March 2017, during the Pac-12 men’s basketball tournament at T-Mobile Arena in Las Vegas, the conference staff was alerted that Larry Scott would soon make a major announcement. There was about to be news. Big news, some thought. Staffers buzzed in anticipation and speculated that Scott had finally closed the Pac-12 Network’s long-awaited distribution deal with DirecTV. Then, a video was distributed to employees featuring Scott, in a solo shot, with the Las Vegas strip pictured behind him on a green screen. The big news? Scott announced that he was getting a five-year contraction extension from the Pac-12 CEO Group. Scott looked delighted. He informed his staff that they’d get to continue the work they’d started through 2022. Especially not with lower paid staffers living in downtown San Francisco, some two or three to a high-rent apartment. But the moment emphasized how out of touch the upper-management team at the Pac-12 headquarters could often be. 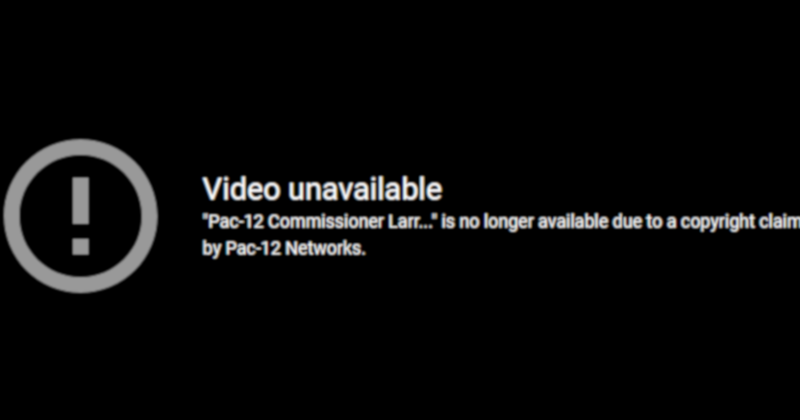 Yes, that video isn’t a great look for the Pac-12, but yanking it down over copyright is an even more hilarious misstep. If they’d left the video alone, it would have gained a little traction, but likely would have been quickly forgotten; it shows Scott being tone-deaf, but there are plenty of examples of that. But trying to remove this is going to create a whole lot more attention for it, as it’s now “the video the Pac-12 didn’t want you to see!” Hasn’t anyone at Pac-12 headquarters ever heard of the Streisand effect? And that’s to say nothing of the ridiculous nature of the networks filing the copyright claim here. This wasn’t content broadcast on the networks or on their associated social media platforms, and it’s not content they’re trying to monetize elsewhere, but rather internal content obtained by a reporter. That’s not at all what copyright regulations are intended to suppress, and using them for that purpose is going to bring much more attention to this video (which will be presumably republished on a site not as quick to pull it as YouTube) than it ever would have received otherwise. And really, that can be said about a lot of Pac-12 mistakes over the years. If they’d said right from the start “Hey, we won’t be able to work out a deal with DirecTV, because our network structure just doesn’t work for them,” that would be less of a repeated punchline than their constant indications of “There’s hope!” that never came true. If they’d struck a deal with ESPN, Fox or Comcast for their network instead of going it alone, they might actually have some carriage. If they’d figured out “Oh, hey, maybe people want us to focus on football” earlier than six years in, their network audience and demand might not be as poor as it is. If the Pac-12 didn’t spend so much time on negotiating deals for distribution in China, maybe they could improve the situation in their conference’s actual territory. And if they didn’t have their command center set up in such a way where officials were making decisions based on commentary from the conference’s general counsel (something Canzano examined in depth this week as well), they wouldn’t be mocked for months over that. But the conference continues to shoot itself in the foot, and this copyright claim is just the latest example of that. It’s also the latest example of more content related to the Pac-12 that no one can watch.